The Hut by Midland Architecture is a Scandinavian-inspired example of “country minimalism” on a cattle farm. 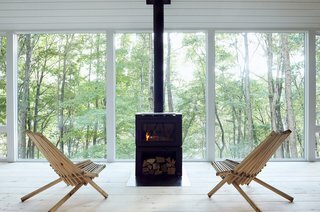 Situated on a 2,000-acre cattle farm owned by the architect’s family in the Ohio Valley, this off-grid cabin—fondly referred to as The Hut—expertly blends Scandinavian-inspired minimalism and the rustic, country lifestyle. 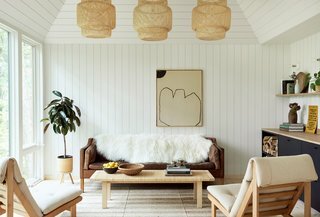 Architect Greg Dutton teamed up with his brother, Chris, and his father, John, to craft this sustainable, 600-square-foot dwelling with simple materials and techniques. A foundation of concrete piers causes minimal impact to the earth underneath, while cedar shingles on the cabin’s exterior allow it to blend seamlessly into the surrounding landscape. 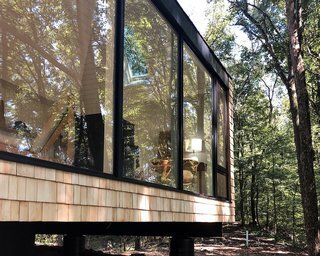 The retreat's exterior is clad in cedar shingles to give it a tree house feel. The shingles will weather to gray over time. 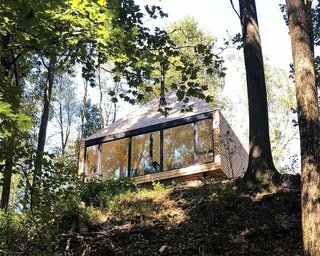 Dutton wanted to avoid having the cabin stand out, instead revealing itself gradually against the surrounding landscape. Building the cabin was a true labor of love for Greg and his family. It rests on a wooded bank overlooking a lake on the farm, which originally was part of a coal mine. "We’ve owned and worked the land for over 40 years, so there is a very deep connection to the property," says Dutton. "We’ve spent [many years] reclaiming the ground and bringing it back to a productive state. The spirit of stewardship extended to the design of The Hut. Building off-grid was another way of acting responsibly on behalf of the property." The Hut rests peacefully on a bank overlooking the lake. In keeping with that, the brothers built a solar panel hut in a nearby clearing that will supply solar power to the cabin and all its utilities. In addition, a rainwater collection system provides plenty of fresh water. These features work in tandem to keep this home’s footprint small. Floor-to-ceiling windows grace the living area. 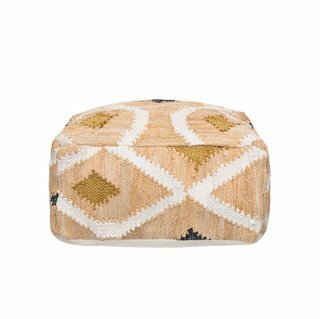 Following on from the huge success of the Odetta rug, is the Amigos de Hoy Odetta Cotton Pouf. It features an earthy base tone mixed with pops of gold lurex and gray. Great for lounging around. 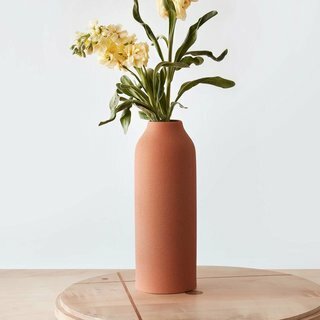 With its earthy terracotta hue and streamlined design, this vase doubles as an art piece. The perfect compliment to greenery or sprigs, it instantly warms up any tablescape or shelf. 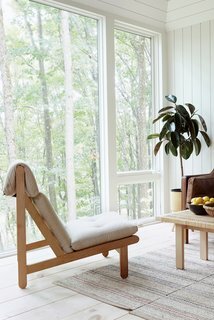 Lovely lounging in the Dom rattan chair from Danish interior brand Bloomingville. 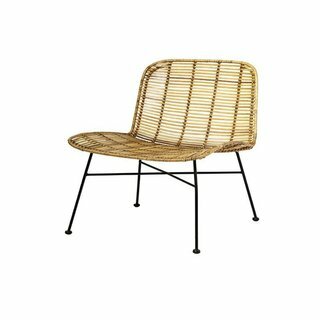 The chair has beautiful playful shapes and is very firmly by the strong rattan and black metal frame. Natural light abounds in this office nook. Aesthetically speaking, the overarching goal for The Hut was to allow the outside landscape to take center stage. As such, a 25-foot wall of floor-to- ceiling windows lines the main living space, flooding it with natural light. Bleached Eastern Pine floors combine with white shiplapped walls to give a sense of being one with nature. Nature takes a center stage in this pared-down dwelling. It’s a theme that continues throughout the space, where details like light fixtures and kitchen countertops reflect these natural wood tones. Says Dutton, "This design, in particular, was inspired by Scandinavian country houses. The simplicity of those interiors was a big driver for the feel we were trying to capture inside the space." 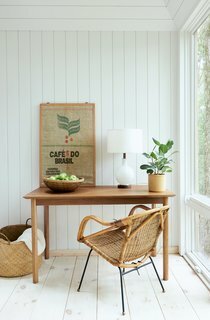 Natural wood tones invite the surrounding greenery to be the focus of this 600-square-foot cabin. The main living space consists of a sitting area and a sleeping area (not shown). Greg wanted to design the kitchen in such a way as to create a juxtaposition between light and dark. But instead of choosing a basic black color for the built-ins, he incorporated a greenish-hued black as another way to incorporate nature into the home. 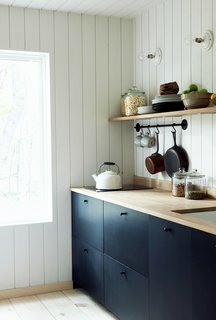 Dark cabinets juxtapose with white shiplap in this simple, functional kitchen. Solar power supplies the electric range top.